Madeleines are one of my most favourite things. I love these delightful tea cakes so much I named my first born after them. Really. Almost second to Madeleines? Maple Syrup. Being Canadian, it runs through our veins and if you happen to be lucky to live near some maple trees, you might try making some syrup for your self! Either way, you should make these! Add juice to the soy milk and let rest. Cream the butter with the sugar, scraping down the sides occasionally, until fluffy. Add the mashed banana to the sugar mixture and combine until very smooth. Add the soy milk - juice mixture, maple syrup and zest to the wet mixture, incorporating well. Mix in dry ingredients to the wet until absorbed. evenly grease and lightly flour your Madeleine pan and preheat the oven to 375ºF. Fill each shell 3/4 full with batter, It'll be thick. With a clean, wet finger smooth the tops and pop any bubbles that may have risen to the surface. Bake until centre has puffed and the edges are crisp and browned; about 20-25 minutes. Cool completely before drizzling over the glaze and sprinkling with flaked maple sugar or crushed walnuts, if desired. Measure and sift the confectioners sugar into a bowl and combine the maple syrup with the whisky to pour over. Whisk until smooth and thickened enough to coat the back of a spoon. 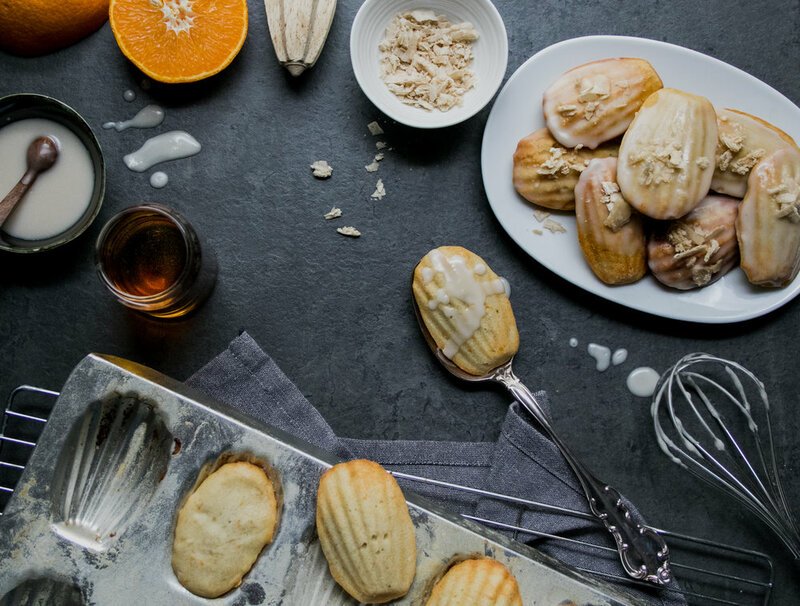 Dip, dunk or drizzle, over each of the Madeleines and allow to firm up and harden while it cools.